Thanks for stopping by. You’ve reached the online presence of a speculative fiction writer. Basically, I write what strikes me as interesting. That encompasses science fiction, thriller, general fiction, historical romance, dark heroic fantasy, horror, space opera and paranormal mystery. Novels, novellas, short stories. No poetry so far but maybe someday. Currently I’m working on a series of science fiction novels with Kensington Books for their Rebel Base imprint. I also spin up a few short stories along the way. The goal is to string words and sentences and paragraphs together in an entertaining way. Writing, even with its manic highs and tortuous lows, rarely fails to grant intrinsic reward to the writer. But in the end, it is the reward of engaging a discerning reader that completes the effort. Decades of wandering the publishing desert have led to an oasis of sorts. Note the vibrancy of life on Earth. It is rare not find some kind of life, regardless of how hostile the environment. But on Mars — currently — there is no life. Perhaps billions of years ago there were primitive lifeforms, and the Red Planet had hot, radioactive cores that created a magnetosphere to fend off solar winds while holding onto its water and air. Now the rock and sand is barren and the weaker rays of a more distant sun can only illuminate the desolation. Writing, on any given day, moves along a scale between these two extremes. As you may have guessed, the Mars Wars series involves terra forming Mars, but there are conflicts and other undesirable consequences …. My Mars – Earth novel and two upcoming ones have found a home at Kensington Books as a three book series for their Rebel Base Sci-Fi & Fantasy line. They crushed the cover art, below. 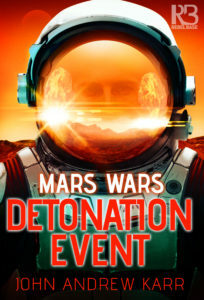 Detonation Event (Mars Wars) is now available via most sellers (Amazon, Barnes & Noble, Kobo, etc.). Mars Wars Detonation Event From Kensington Publishing in 2/2019 as part of Rebel Base books. Very cool to have my story, “The Paisley Witch,” included in one of Flame Tree Publishing’s latest anthologies, Pirates & Ghosts Who else is making such handsome books these days? Silver, matt laminated, gold and silver foil stamped, embossed. New Reader Magazine published my science fiction short story, “The Foot Race,” in their inaugural issue. Amazon has the list of my small press and indie titles, until I can incorporate them on this site.